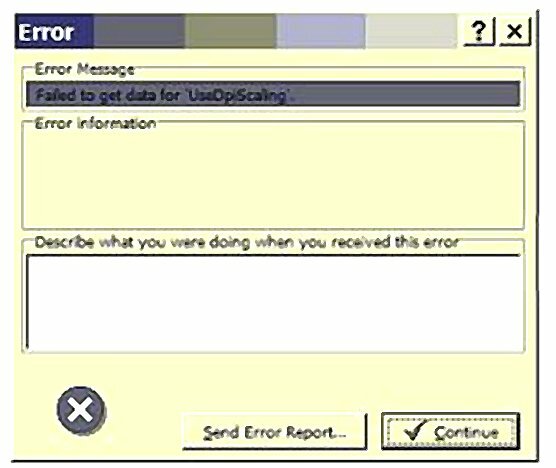 Failed to get data for "UseDpiScaling"
This Issue seems to be related to large screen resolutions and the DPI settings in Windows 7. In the case we were looking at, the DPI settings were set to Normal, so at first glance the issue did not appear to be a DPI issue. However, we noted that “Use Windows XP style DPI scaling” was turned on. This was what was causing the issue. Go to “Control Panel\Appearance and Personalization\Display” and click on the “Set custom text size (DPI)” option. Uncheck the “Use Windows XP style DPI scaling” check box and if needed, log off to apply the changes. While this issue is also related to screen resolution and DPI settings in Windows7, Server 2008 exposed the anomaly in a different way. After the new version was installed on the server for Terminal Services sharing, the errors started appearing. When the System Five icon was opened, this error appeared… [Failed to get data for UseDpiScaling], after hitting Continue, System Five partially opened but the screen only had a top bar with grey on the rest. Closing the page with the [x] got a Status 12 on Setup.btr Error, and returned you to the desktop. We found that the Screen Font on the Server 2008 desktop Font DPI was set to 120dpi not the 96dpi default, this was causing System Five to crash out with errors as we found. The desktop had been personalized to show bigger text and icons due to the use of high resolution monitors. The Server 2008 on this site was updated two weeks ago, may have caused the new update to react negatively when checking the Windows registry related to the DPI settings. We got the local IT people involved, not sure why but while the Users had Read access, the T/S domain users had no access to Read the Registry settings which was critical.